The crest consists of a blue and green butterfly perched on an outstretched hand, enclosed by the school name and motto. Blue indicates a sense of protection, loyalty and faith, green indicates a sense of growth and nurturing, while both colours nod towards nature; the sea and sky, trees and plants. The butterfly is a delicate creature, and just like a child, needs to be nurtured and cherished. In the home, parents aim to nurture, cherish and educate their children, before they are entrusted to the teachers of Scoil Chormaic, when these endeavours continue. 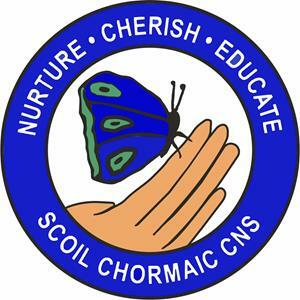 With parents’ support, the children will mature beautifully in the hands of Scoil Chormaic. The hand stands for support, as the children are helped along on their journey through life. The right hand connotes the Community National School motto; that this new model of school represents the right choice for parents in modern Ireland. The butterfly is decorated by three green circles, Scoil Chormaic being the third school of its kind to be established in Ireland.